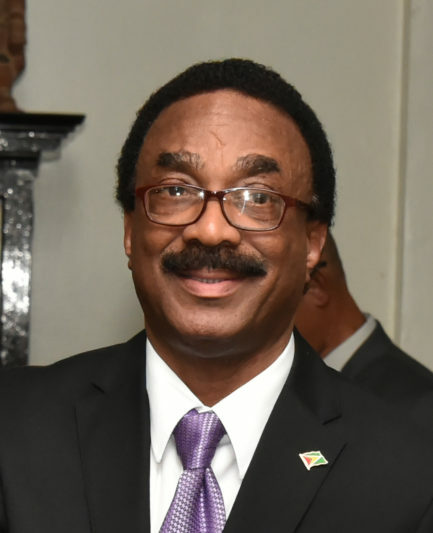 Attorney General Basil Williams has advised government that Speaker of the National Assembly Dr Barton Scotland erred in ruling that the PPP/C-sponsored no-confidence motion against the government was carried and has urged that the Speaker be invited to reverse the ruling. “The quintessential fact is that there has been an error on the part of the Speaker in ruling that the vote was carried. The ineluctable conclusion is that the vote was improper and unconstitutional. The Constitution’s ethos and norms must be maintained in order that Parliament do not act or purport to act in a manner subversive to the Constitution,” Williams said in a Legal Memorandum submitted to the government and which was seen by the Sunday Stabroek. Opposition Leader Bharrat Jagdeo last night dismissed the Legal Memorandum as the “latest act of desperation of a power drunk group who wish to cling to power at all cost and in the process, to subvert and trample upon our Constitution, the integrity of the National Assembly and indeed, the Rule of Law”. Jagdeo had on Friday warned of “instability” in the country should there be a reversal of the acceptance of the December 21 no-confidence vote. Former APNU+AFC parliamentarian Charrandas Persaud had defected from the government benches and voted in support of the motion which was passed 33-32 against the government. Jagdeo had said that the PPP would not accept any reversal. Williams’ conclusion rests on several grounds including the argument first advanced by attorney Nigel Hughes that a majority of all elected members in the 65-member House is 34 rather than 33. 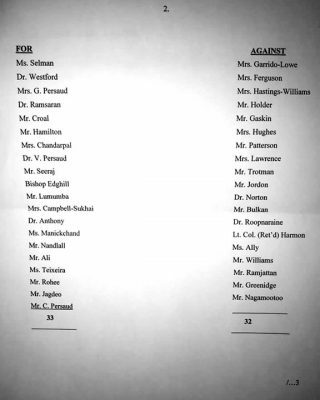 Other arguments raised include that Persaud, a Canadian citizen, by actively acknowledging his allegiance to a foreign power by using his Canadian passport to travel, is disqualified from sitting in the House and casting a vote. According to Williams, there was a miscalculation of the majority of all elected members as required under Article 106(6) of the Constitution for the government to be defeated on a vote of no-confidence. “In order for the government to be defeated on a vote of confidence, 34 or more votes of all the elected members in favour of the motion was required instead of 33. This assertion is grounded in established Parliamentary precedent and practice and case law in the Commonwealth,” Williams said. He said that the Speaker now has to consider whether 33 votes in favour of the motion of no-confidence amounted to a majority of all elected members in accordance with Article 106(6) of the Constitution, and whether the motion was passed in accordance with Article 106(6). Pointing to the requirements of a “majority of all elected members of the National Assembly” as distinct from “a majority of the votes of the members present and voting” as outlined in the respective Articles, the AG reasoned that the constitutional requirement for voting on a motion of no-confidence is distinct from voting on the passage of legislation and ordinary motions in Parliament. “The framers of the Constitution by requiring the vote of a majority of all the elected members of the National Assembly have set the requirement as an absolute majority,” Williams said, emphasising that it is clear that the intention of Article 106(6) is that there must be a majority of all the elected members of the National Assembly as a vote of confidence falls outside the ambit of Article 168. He noted that the passage of legislation and motions outside of Article 106(6) procedurally only requires a vote of those members present and voting. The case sought to interpret Article 43(2) of that country’s constitution which states that if (a no confidence motion) is supported by an absolute majority of the members of Parliament, the Prime Minister and other Ministers shall cease to hold office forthwith but shall continue to exercise their functions until a new Prime Minister is elected. Vanuatu’s Parliament consists of 52 members as opposed to Guyana’s 65-member House. According to Williams, mathematically half of all the elected members of the current National Assembly would result in a fraction of 32.5. He said that there are judicial authorities in the Commonwealth to show that where a number results in a fraction, the next highest whole number would represent the majority. “In the instant case as half of 65 results in the fraction of 32.5, that figure should then be rounded to the next whole number being 33 which would represent half of the elected members. In accordance with practice application of the meaning of majority means that ‘1’ must now be added to ‘33’ to calculate a majority,” he argued. Consequently, he said, the majority legally required in Article 106(6) for a vote of no confidence to pass shall be 34 or more of elected members of the National Assembly. Another argument advanced is in relation to Persaud’s Canadian citizenship. Since nomination day in 2015 and up to the time of voting on the no-confidence motion, Persaud held a passport and possessed the rights and obligations as a citizen of Canada. Williams argues that in keeping with Article 155(1) of the constitution which provides that “No person shall be qualified for election as a member of the National Assembly who: (a) is by virtue of his or her own act, under any acknowledgement of allegiance, obedience or adherence to a foreign power or state,” Persaud was not qualified for election as a member of the National Assembly. Case law cited including the Jamaican case of Dabdoub, Abraham v Daryl Vaz, Carlton Harris and Attorney General Claim No. 2007 HCV 03921. A copy of Persaud’s Travel Record was referenced. Stabroek News understands that the record shows Persaud using his Canadian passport for travel on several occasion before and after he assumed his seat in the House. Williams also raised the issue of whether the Speaker can reverse the ruling that the no-confidence motion was carried. He argued that the Speaker can. He said that the Speaker is duty bound to observe the Constitution as the supreme law of Guyana and if there is an error on the face of a Ruling by the Speaker that is contrary to the Constitution, that error can be revisited and corrected by the Speaker, without the aid of Parliamentary process, once he recognises his constitutional mishap. Meantime, Williams also addressed the effect of the sub judice rule should the Speaker’s ruling be challenged in the courts. Standing Orders 20 (1)(i)(a), 26(g) and 41(2) state that questions, motions and reference shall not be made to matters that are sub judice or under adjudication by the courts. Williams submitted that review of the ruling by the Speaker and any subsequent debate that follows does not offend against the sub judice rule. He cited several precedents in this regard. “In this case the vote in Guyana is contrary to Article 106(6) and must be set aside as being ultra vires and repugnant to the Constitution,” Williams argued. He noted that in one case in The Bahamas, the court indicated that it can intervene where irreparable harm would be caused. 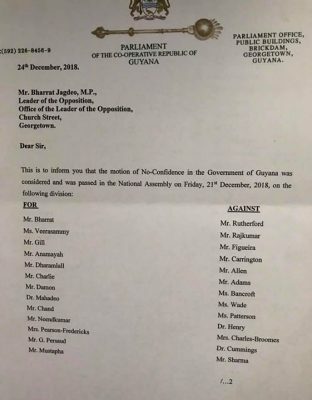 “The vote in the Guyana Parliament is an instance in which irreparable harm would be caused and requires the Court’s intervention,” Williams submitted. In his statement last night, Jagdeo said that it would be recalled that the Speaker has already ruled that the motion was carried and consequently, the Clerk of the National Assembly has already issued a resolution pursuant to the said motion. He also pointed out that on the very night of the 21st December, 2018, the Prime Minister informed the press that the Government was defeated by the no confidence motion and committed that the Government would comply with the ensuing constitutional process of going to elections within 3 months. Further, the following day the President conceded that the Government was defeated by the no confidence motion and publicly announced the Government’s preparedness to comply with the consequential constitutional prescription. Jagdeo declared that the Speaker has no further role to play in relation to the no confidence motion and has no review powers whatsoever over the already completed process. He added that the Legal Memorandum “constitutes an amalgam of misconceived and ill-conceived legal arguments and the citation of a host of case law authorities that are absolutely irrelevant to the propositions which they purport to support. In the circumstances, we reject this “Legal Memorandum” as vexatious, frivolous and wholly irrelevant. The Speaker is urged to do likewise. “Again the Leader of the Opposition calls on the Government to immediately begin the preparations for the holding of elections in accordance with Article 106 of the Constitution”, Jagdeo stated.